Tribute to Whitney Houston, Donna Summer and friends. Together Dina David and Alisa Gray bring to the stage the dynamics from the 70 -80″s Disco Dance Days a spectacular show. Hayes Loau, Our Multi Talented, Charismatic and High Energy Performer. Singing music from Earth Wind n Fire, Prince, and lots more… Hayes adds his dance moves and added charisma and smooth dark sounds to our production. Added with our Male vocalist adding charisma, and smooth dark sounds, this is a vocal and dance spectacular production. Dina won Australian Singing Competition… singing Whitney’s “I will always love you” and 2ND in the World Singing Competition in Finland. Dina is one of Australias Best Vocalists. Her rich vocals and amazing range is up with the best in Australia and now the world. Dina has represented Australia in the World Vocal competitions in Finland, she is a powerhouse vocalists like no other. Her vocal range suits the songs of Whitney Houston. Dina is a star in her own right, bringing elegance, purity and dynamic sounds to our stage. Our show has spectacular production, glamorous costumes, amazing dance. Production added aerial artist (where applicable) Dynamic Dance Duo, Lyrical Contemporary pieces, fluttering fan dancers and much more. 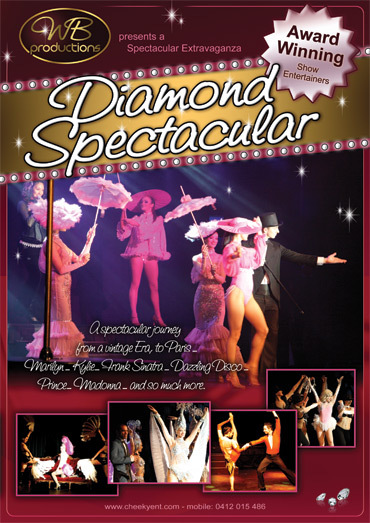 Added with our Male vocalist adding charisma, and smooth dark sounds, this is a vocal and dance spectacular production. Or we can accommodate your venue or event with tailor made formats. “I Wanna Dance with Somebody” is a magical journey of songs from the 80’ to present and includes Alisa Gray……ACE Award Winner for Female Vocal Performer of the Year 2012. Petite to Grand packages to suit all venues, clubs, theatres and corporate events.